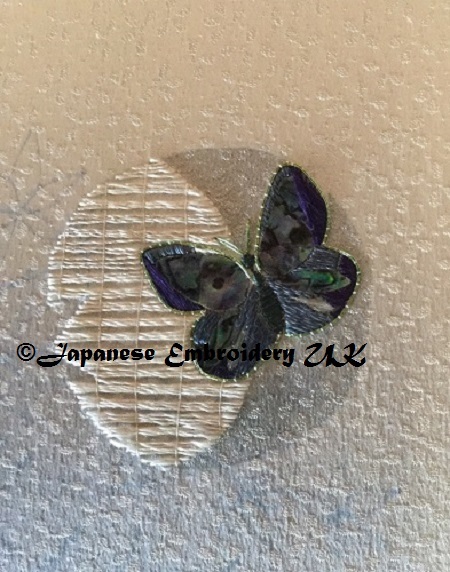 Japanese Embroidery UK is pleased to announce the creation of a new modular learning system for the beautiful art of traditional Japanese embroidery. 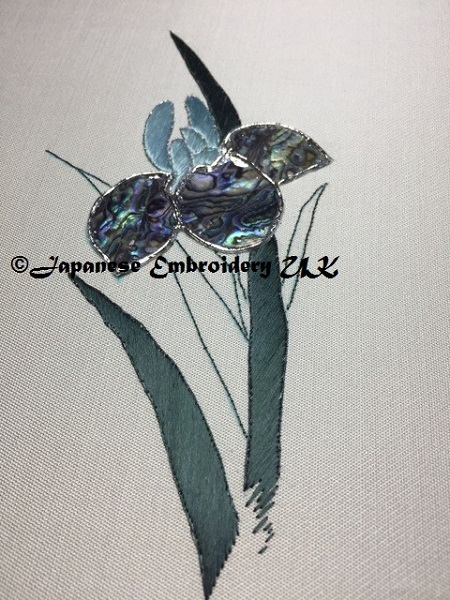 As traditionally trained Japanese embroidery tutors, we aim to pass on to you the art and techniques of this beautiful embroidery using our new, more accessible modules. 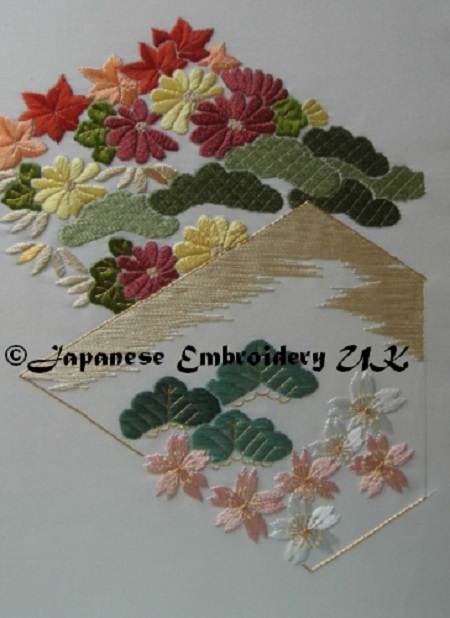 The new modular curriculum being offered by Japanese Embroidery UK covers all the widely used traditional techniques as well as some that are less well known, with each module increasing your skills and knowledge. Unlike the very traditional way of learning, copying and reproducing with no input, our new modules aim to stretch the students way of thinking from the first. 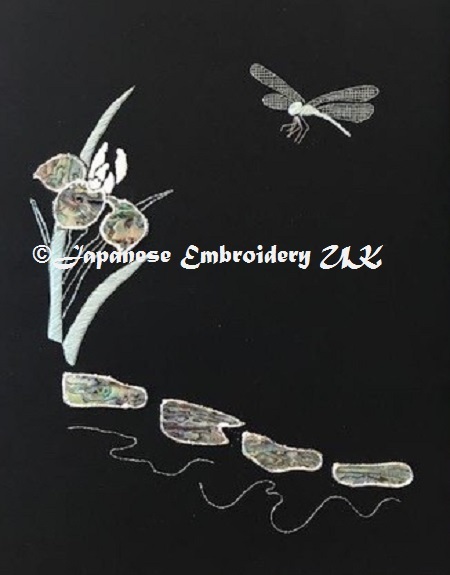 In this way we aim to not only produce technically excellent embroiderers but those who can take Japanese embroidery into the future. 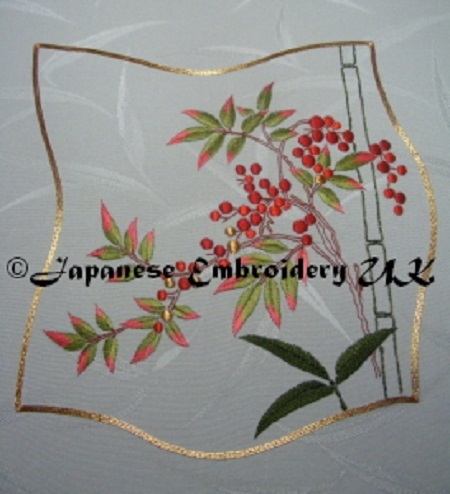 Japanese Embroidery UK offers a choice of learning. 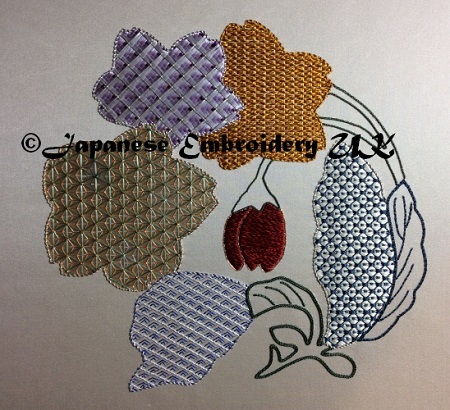 Students following the modular system would be taught alongside students who are following the Japanese Embroidery Center (USA) curriculum. We do not split the classes, they are all multi level and, with the addition of our modular system, will be multi stream as well. 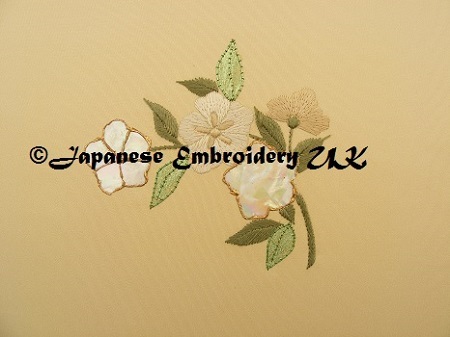 If you follow our modular curriculum and attain proficiency in your embroidery, you will qualify with Japanese Embroidery UK and not through the American Center in Atlanta. 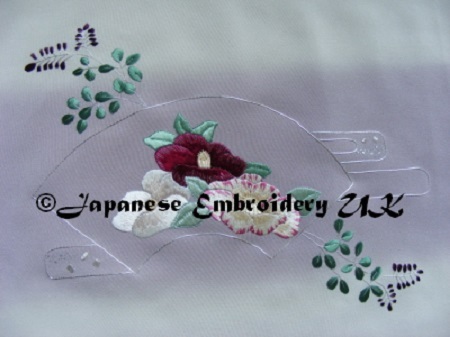 The curriculum offered by the Japanese Embroidery Center is detailed at www.japaneseembroideryuk.com. 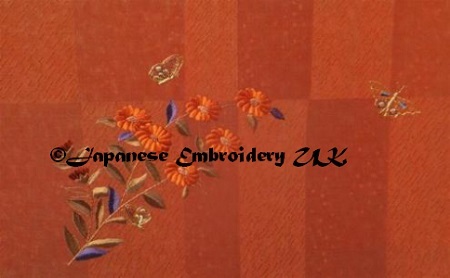 The first module introduces the new student to the most important basic techniques of Japanese embroidery. 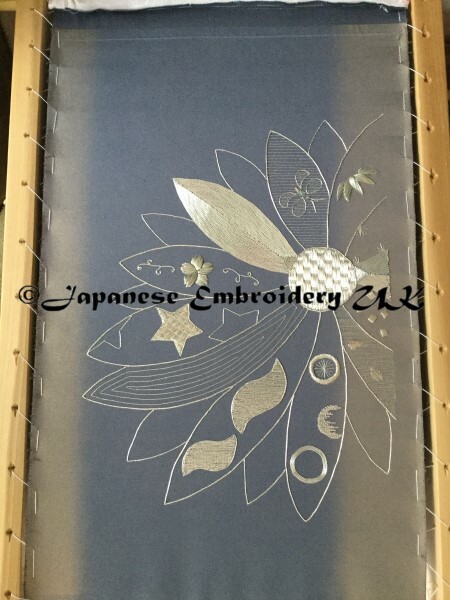 It teaches the importance of correct framing up, and use of tools as well as how to handle flat silk and begin to make twisted threads. Techniques included are Diagonal, Vertical and Horizontal Layers, Line of Staggered Diagonals, Lattice Holding and Couching. 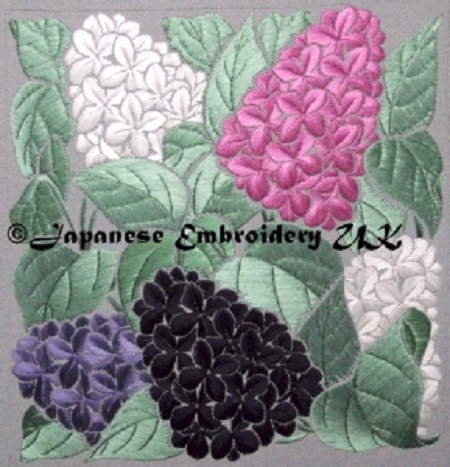 The Chrysanthemum is well known as the primary symbol of Japan and the Japanese imperial family, and Wisteria is widely used as a popular family crest. 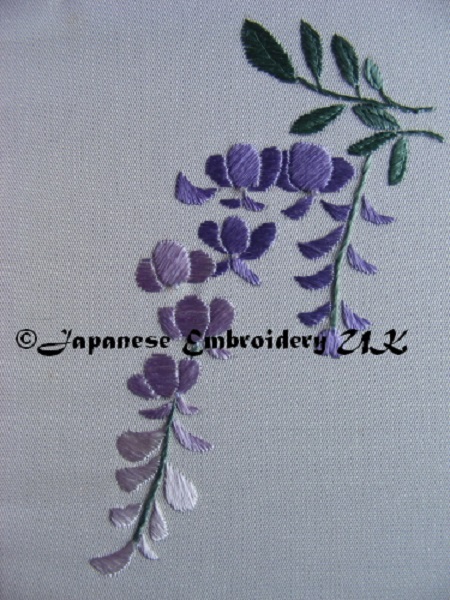 Wisteria is a symbol for April (Japanese name is Fuji), and Chrysanthemums are symbols for September (Japanese name is Kiku). The Wisteria combined with the boat gives the feeling of movement. The autumn climate can be hot and the hut is surrounded by Chrysanthemums and grasses. It offers shelter and a cool place to rest on a journey. 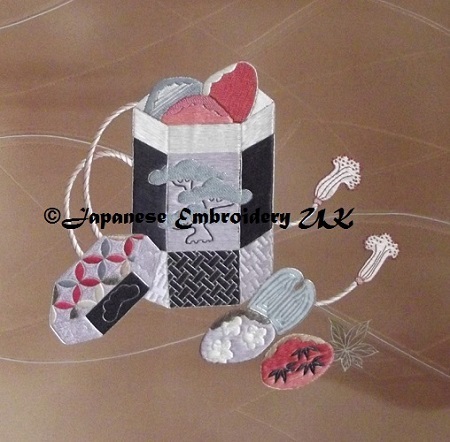 The second module introduces you to four more, widely used, stitches featuring flat and twisted threads. 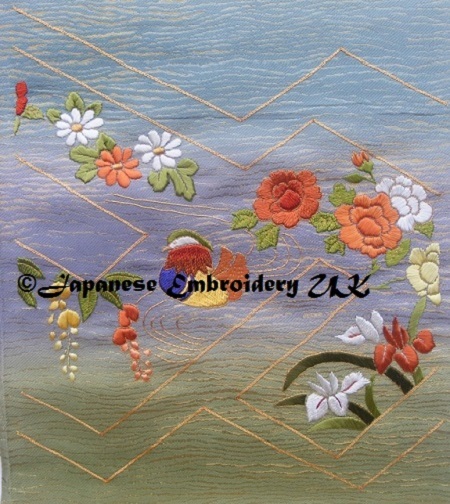 These include diagonal layer and separated single layer, frequently used for petals and simple leaves, with a base of horizontal layer enhanced with couched gold. Peonies (Botan) are a favourite flower of the Japanese, representing good fortune and high honour, and the chrysanthemum is the national flower. Hexagons are a representation of the shapes on the back of a turtle shell. The turtle is a symbol of long life. 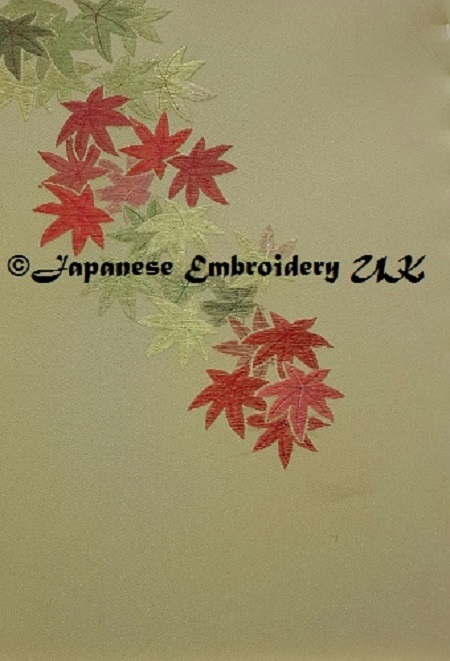 Maples are another important symbol in Japan along with Cherry Blossom. As an autumnal symbol they are often combined with Chrysanthemums, bamboo and pines. This module introduces the student to the Japanese novel and geometric effects. There are five effects to stitch; four are pre-determined, the fifth is the students own choice taken from a list of suitable effects. 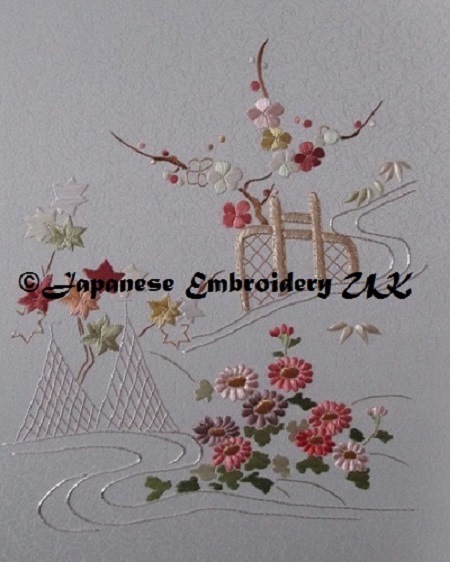 Although stylised, these designs represent the Cherry Blossom and the Paulownia. 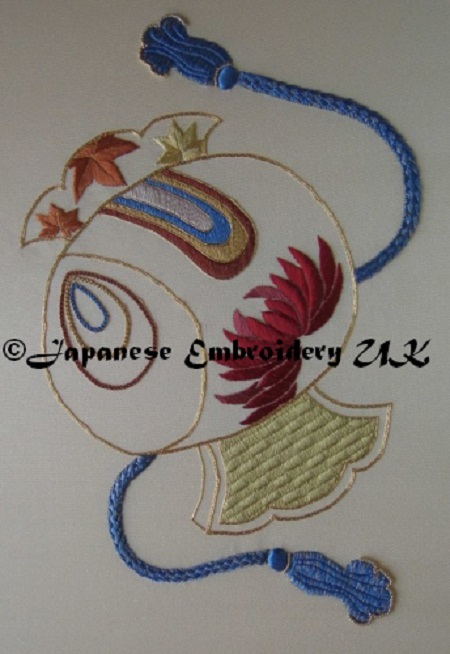 Cherry Blossom is beloved by the Japanese and its fragility is a symbol much used as crests (mon) by Samurai families, a representation of the fact that Samurai warriors lives could be as short as that of a cherry blossom. Spring is a time when the trees are in full bloom and much admired, and Cherry Blossom Viewing festivals are attended by many. 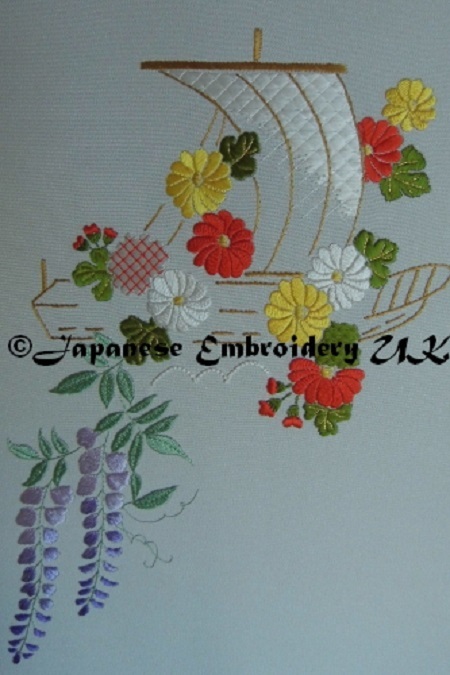 The Paulownia tree has beautiful pale blue lilac blossoms but it is the wood that is especially important as it is very light, does not warp and is particularly used for furniture such as kimono storage chests. 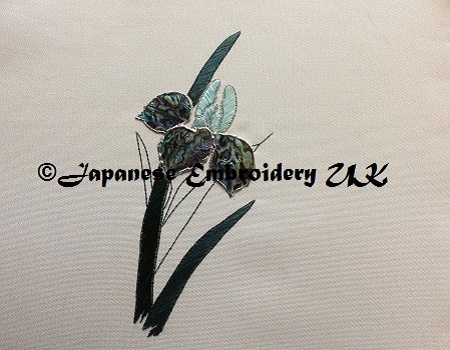 Module four introduces the student to the superimposed techniques used in Japanese embroidery. 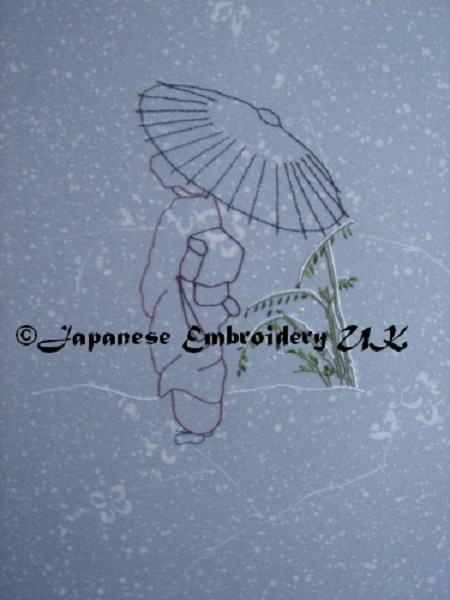 The motifs used in this design represent sho chiku bai (pine, bamboo, and plum (ume) blossom  the Three Friends of Winter). Since ancient times these three plants have been symbols of longevity, friendship, strength, and integrity. 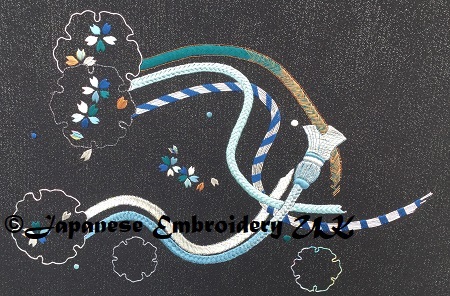 Over time they have become common subjects in Chinese and Japanese painting, calligraphy, and textiles, becoming an expression of celebration and joy, especially in the New Year season. Module 5 is designed to introduce students to several of the more formal cord techniques. 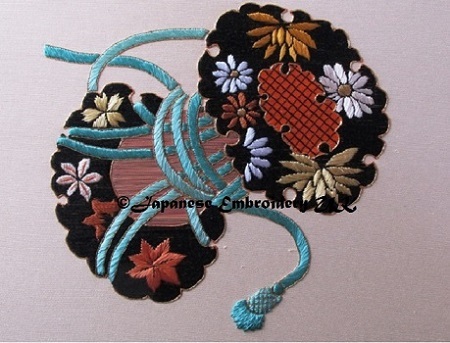 The spiralling flower (nejiribana) motif is a familiar one in Japan and the petals of this nejiribana are filled with small seasonal flowers. 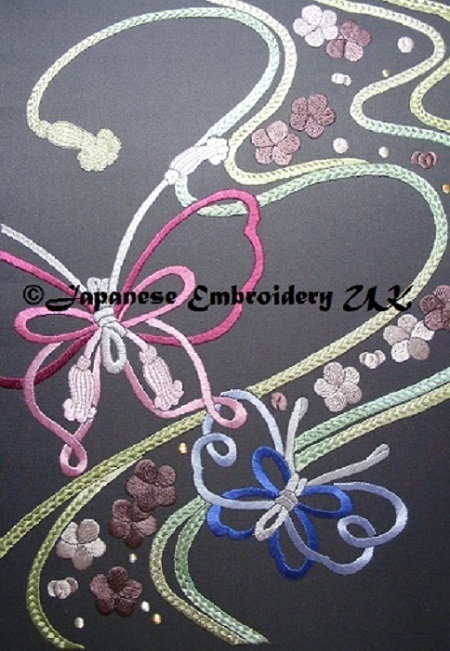 All of the Module 5 designs can be stitched in different colourways after discussion with your tutor. This option will depend on the alternative fabric colours being available. This module is an introduction to padding from the subtle to pronounced. 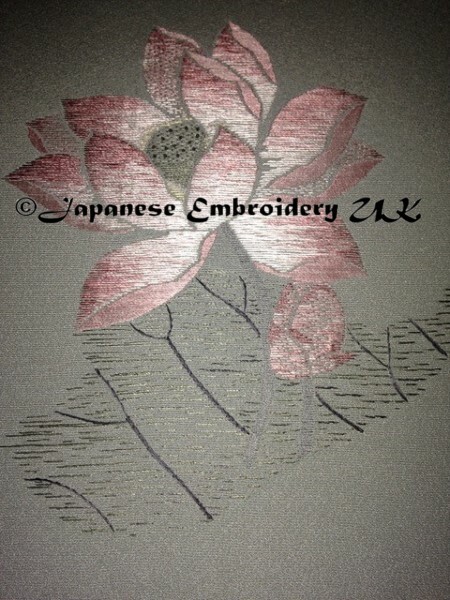 Padding is used in a number of ways to bring a feeling of depth to a wide variety of subjects including flowers. The magic mallet is viewed as an attribute of Daikokuten, one of the Seven Gods of Good Luck, and striking the mallet is said to grant all wishes! The orchid offers a feeling of serenity. 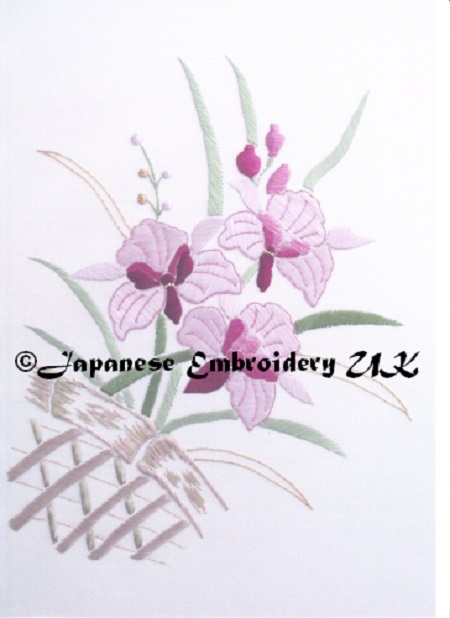 Although not as prominent in Japan as in China, where they are often combined with the pine, plum and bamboo (known as sho-chiku-bai in Japan  The Three Friends of Winter), in China orchids are known as one of the Four Friends and, when combined with plum, bamboo and chrysanthemum they are called the Four Gentlemen. This module is all about long and short stitch. Alternating long and short and random long and short are taught together with techniques such as how to go from a wide space to a narrow one and how to achieve the perfect edge. The student has the choice of where these techniques are placed on the design. Tsubaki means Camellia in Japanese. 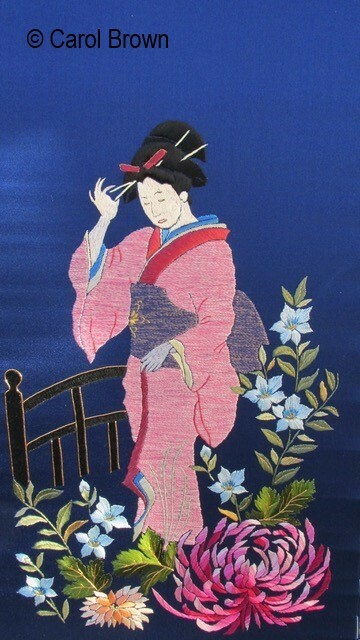 The ancient Japanese used the stems, leaves and seeds to produce dyes, implements and oils. Nowadays the interest tends to be mainly horticultural. 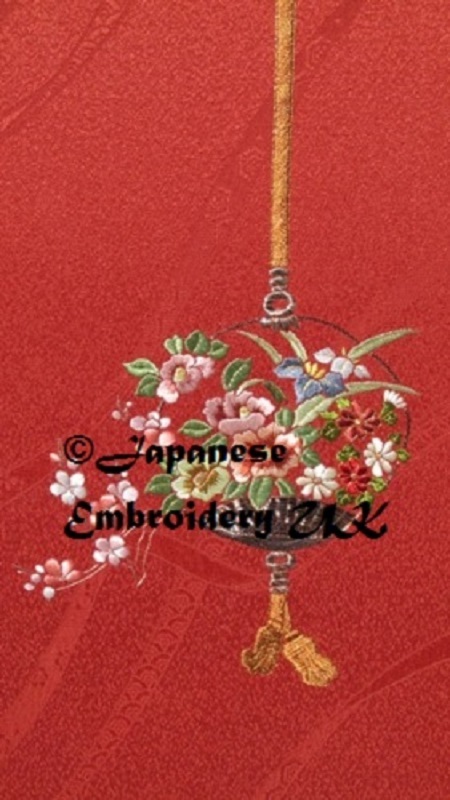 The Camellia is a member of the tea family and therefore is associated with the Tea Ceremony. The Camellia blooms in the winter in Japans temperate regions and represents November or December on the floral calendar. Bush Clover twigs are used in the coming of age ceremony in the eighth lunar month. 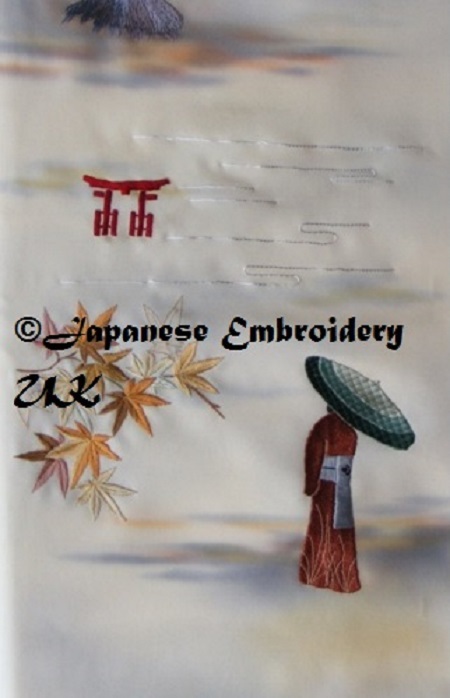 It is a symbol of Autumn and is the first of the Seven Grasses of Autumn. Bush Clover and Wild Boar form one of the standard themes of the Hanafuda card game. The student has the choice of where these techniques are placed on the design. 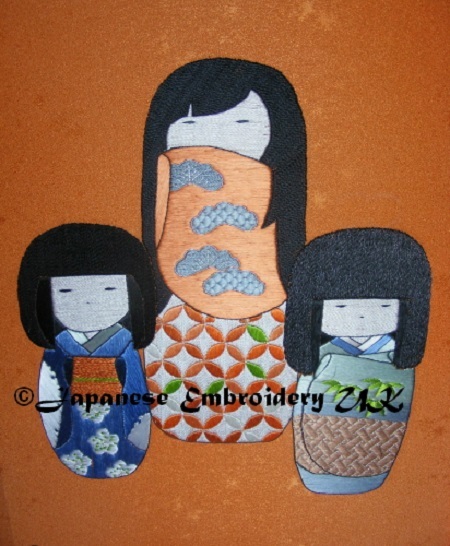 Also choice of fabric is in the hands of the stitcher. 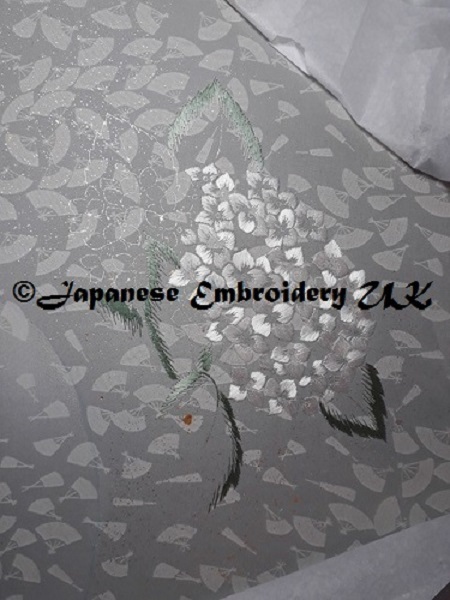 The free form daisy like flowers in this design are meant to create "Calm" within the stitcher while being stitched. The pastel colours chosen add to this. Bush Clover twigs are used in the coming of age ceremony in the eighth lunar month. 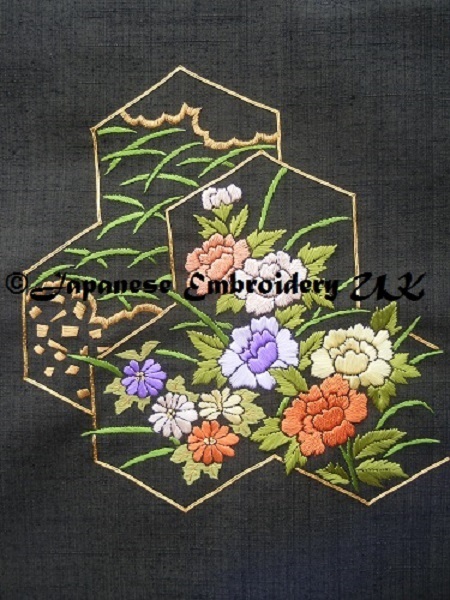 It is a symbol of Autumn and is the first of the 7 grasses of Autumn. Bush Clover and Wild Boar form one of the standard themes of the "Hanafuda" card game. Module 8 is designed to introduce the student to Weft Valley Layer (fuzzy effect). This deceptively simple technique can create beautiful effects once it has been mastered. Our metallic work designs are intended to give students a wide variety of techniques to accomplish. Some techniques will already be familiar, others will be new. 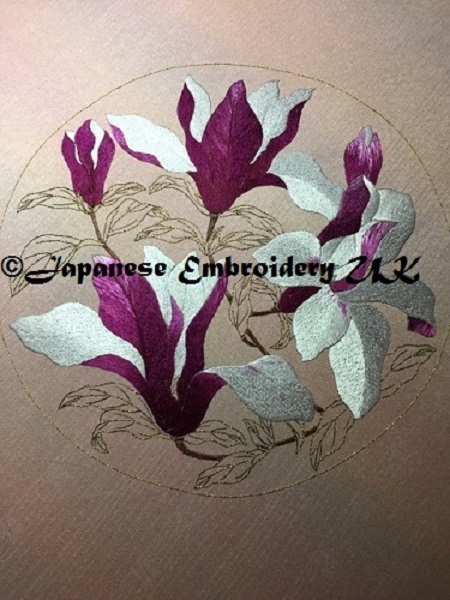 These designs will incorporate both stitchable and couched gold and/or silver, or a combination of shades and sizes of metallic threads, the use of various colours and types of couching threads to enhance a design, padding and edging. 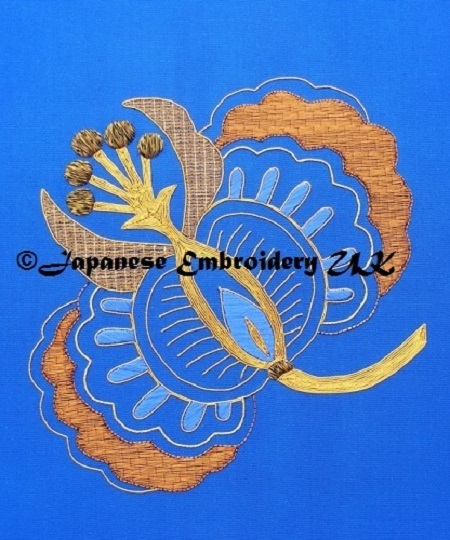 This design based on the traditional Chrysanthemum offers a variety of goldwork techniques, some with padding. 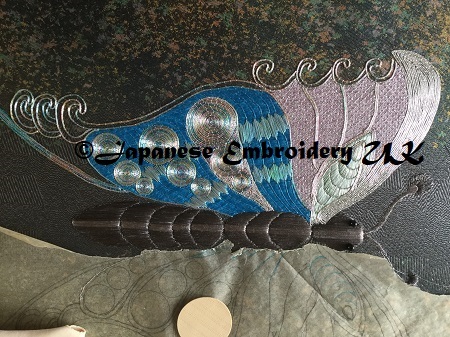 The student will have the opportunity to vary colours of both the metallic and couching threads to create a design uniquely theirs. 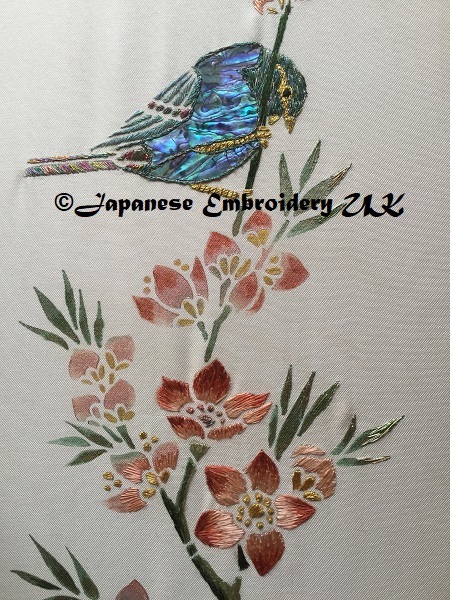 Hosoge is a goldwork piece which teaches several techniques, using various thicknesses and colours of metallic thread, and combines them with flat silk thread. 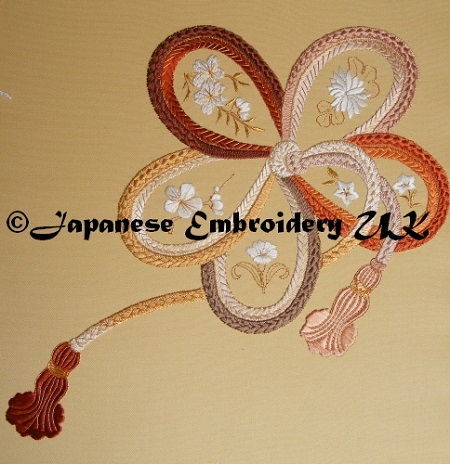 Hosoge is an imaginary flower and means literally Flowers of Precious Appearance. 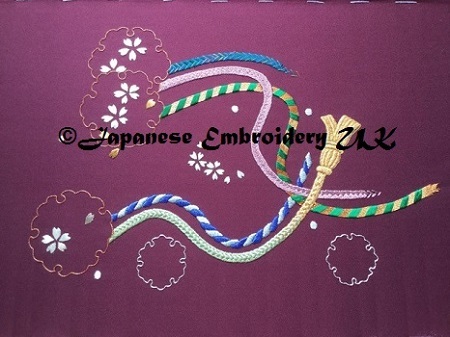 They are sometimes referred to as Flowers which bloom in Heaven and can be seen in Arabesque patterns combined with Karakusa and are a more lavish version of Karahana. 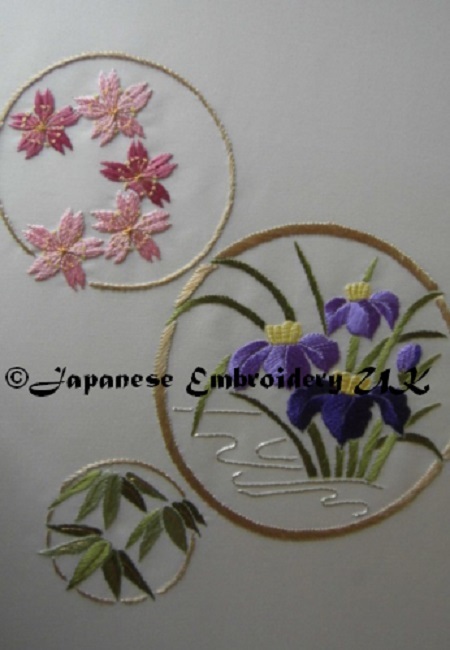 This beginners practice piece emphasises the handling and shading of flat silk, padding stitchable gold thread, and varieties of twisted and couched threads. 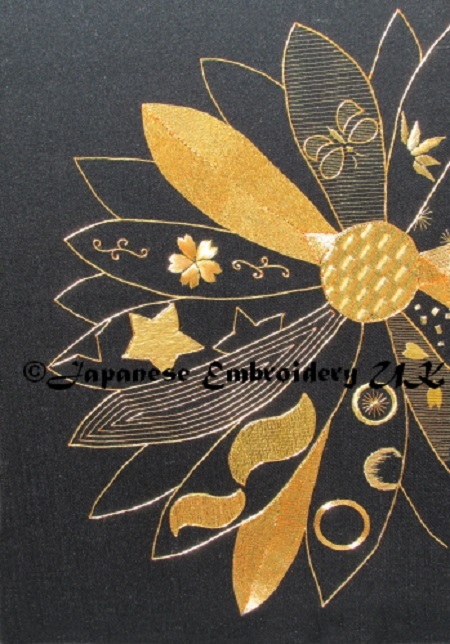 It also gives the student practice in controlling and couching thicker gold threads and creating sharp corners. Nandina connotes the disappearance of bad fortune and it is best known for its use in New Year arrangements that symbolise longevity and is, as in the design, often shown with bamboo which is one of the Three Friends of Winter, the other plants being plum and pine. 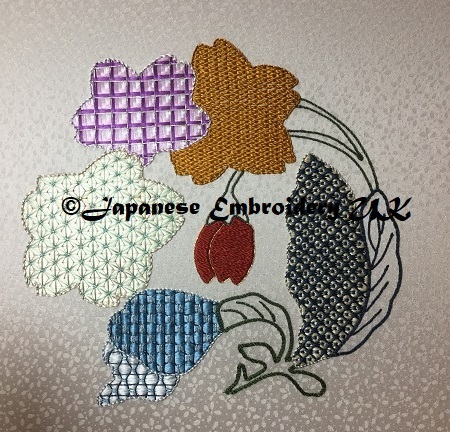 This design uses simple stitches to compliment the rich colours. There is a very limited supply of this particular fabric. A portrayal of the glow the final fling of autumn colour brings, with the butterflies signifying the hope for renewal in the following year. 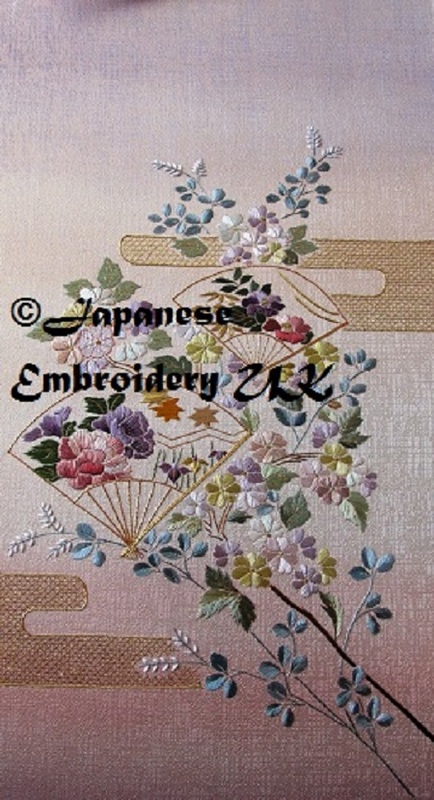 These two beautiful designs have been adapted from an antique Japanese design book. 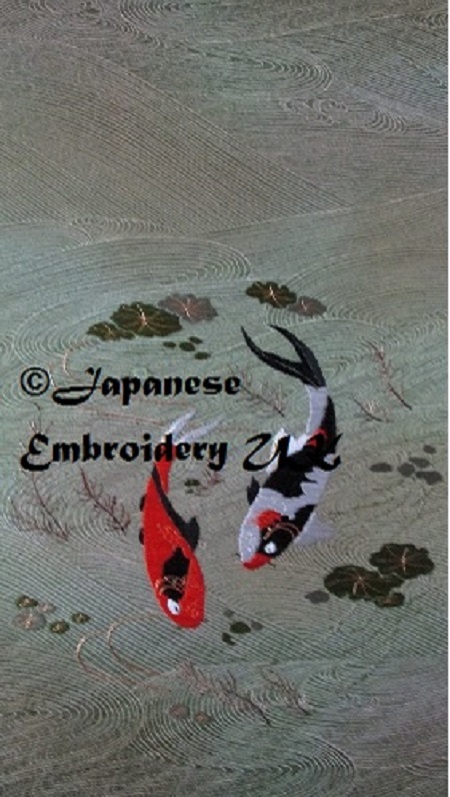 They are both embroidered with the simplest of techniques in order to bring out the beauty of the silk. Geisha are professional Japanese entertainers. They serve several years as a Maiko (a trainee Geisha) learning Japanese Dance, how to play a musical instrument, how to serve tea at a tea ceremony and much more before becoming Geisha. Originally a wild plant which the Japanese domesticated. By the Heian period it was celebrated at parties sponsored by the aristocracy. It is usually shown hanging from trellis and is included with butterflies and fans. The iris is a popular motif in Japan and plays a prominent role in garden design, especially when planted in streams and combined with plank bridges. 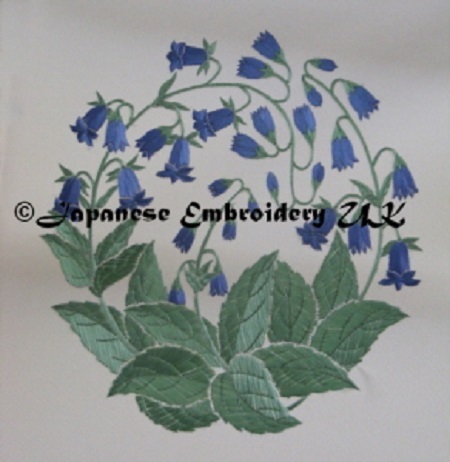 It is also used in family crests. 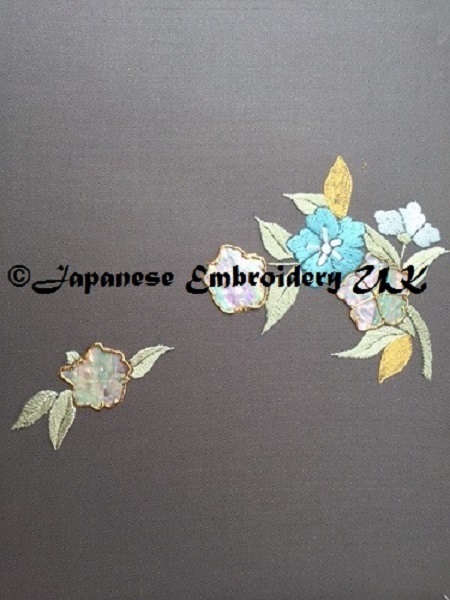 Here is appears with cherry blossom and bamboo. 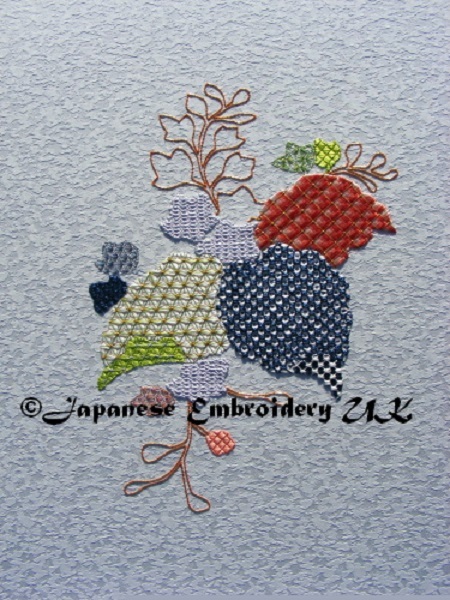 Pheasants with Blossom A design presenting the challenge of colour blending combined with a variety of stitches. 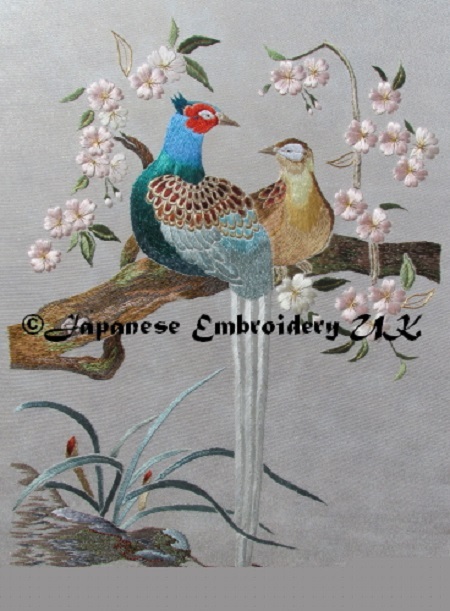 Spring brings the cherry blossom and the pairing of these Japanese pheasants, nests to build, eggs to hatch, chicks to raise, a time of new beginnings. 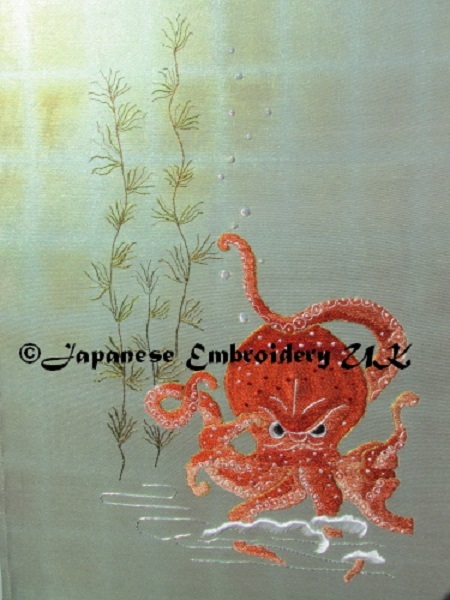 This design uses shaded weft layer with padding, staggered diagonals and knots for the Octopus (Tako). Kimuzukashii means grumpy or grouchy. 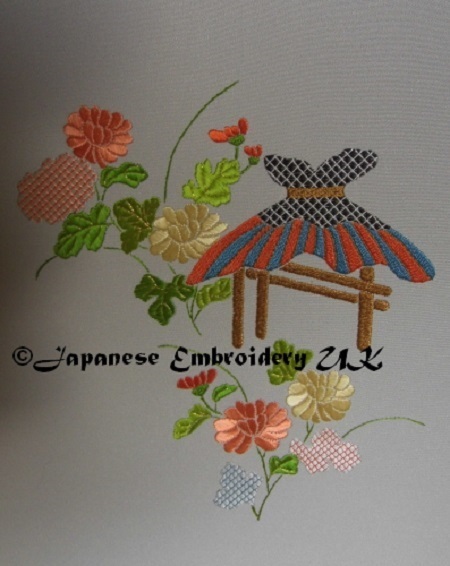 The idea was inspired by a picture of the detail on a dyed noren (curtain). His expression made the designer of this piece smile each time she saw him and she had to capture that scowl ! Although students may work on after class, each teaching day is from 9.30 a.m. to 4.30 p.m. Please contact us to book the class and ring the hotel for room availability. When making your hotel reservation please mention that you are part of our course. Bookings can be extended if desired. Although students may work on after class, each teaching day is from 10.00 a.m. to 5 p.m. When making your hotel reservation please mention that you are part of our course as a special price has been arranged. We are constantly working on new designs for all our Modules and Advanced Modules and hope to have some new designs to show you shortly. 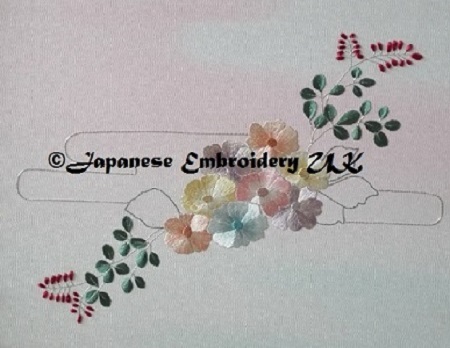 The website and its contents is the Copyright © of Japanese Embroidery UK 2013-2019. All rights reserved. Any distribution or reproduction in part or all of the contents in any form is prohibited other than the following:- You may print and download to a local hard disk for your personal use and non commercial use only. 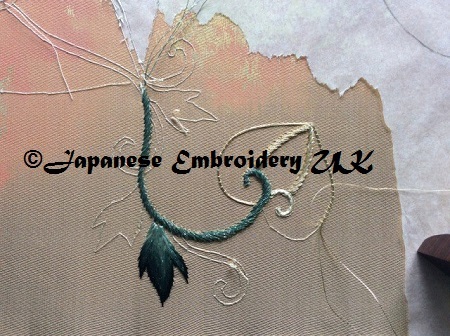 You may not distribute or commercially exploit the content unless without the express permission of Japanese Embroidery UK. Nor may you transmit it or store it in any other website or other form of electronic retrieval system.